It’s like I flew to the Caribbean over night. I just sat in the sun for an hour, wearing only a tank top and shorts. I had to come inside in case I was in jeopardy of getting a sunburn. Sunburn?! A few days ago, it was snowing! And it is only meant to get hotter through the weekend. It definitely lifts my spirits. Although, you know how odd it is when you have a cold during the summer? That’s how I feel. I took my bad turn for the worse at the end of last summer, so it feels all wrong to be sick in the heat. 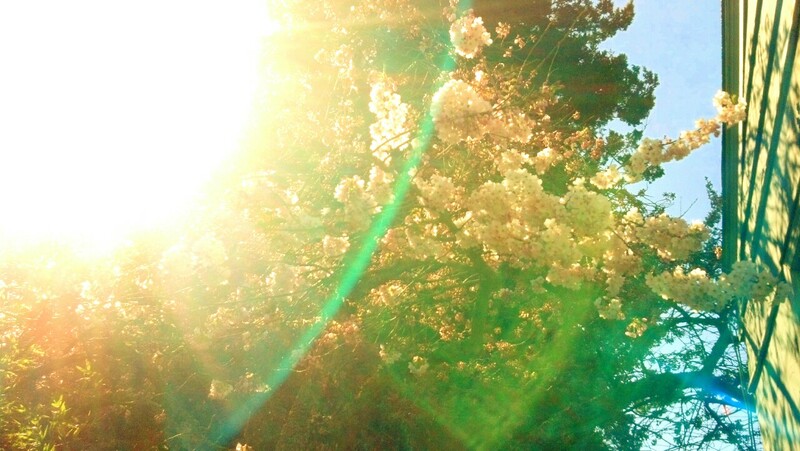 Intense spring sun is meant to energize and bring a low hum of excitement and vibrancy. Instead, my head is full of cotton balls, my body is swollen, throat is scratchy and my muscles are extremely stiff. But, it’s warm out… focus on the positive! And, speaking of positive moments, I thought I should let you all know that I felt good yesterday. Yesiree, I said GOOD. I drove myself to an appointment that was only about ten minutes from my house. I stopped at a store and got lunch from the deli (this is the first time I have walked into any building but a clinic or hospital in months). I walked around the garden with my dogs. I stayed awake until 11pm and actually felt okay after 6pm ~ able to watch a movie, able to laugh. There always has to be an unfortunately and, unfortunately, my night was quite tortured. I stopped wearing the cpap about a week ago as an experiment. My allergies flared up and I was too stuffy and inflamed in my sinuses to use the nasal masks (the alternative is a full-face mask, but mine is extremely bulky and wakes me up as I thrash around). My brain during sleep fascinates me. I would love to see an fMRI of the whole night. I would love to do a sleep study in my own bed and really see what happens from minute to minute. My brain is on fire. It is infected by unease. In the brief moments of waking ~ like surfacing periodically from quicksand ~ before the incubus’s long fingers push me down into unconsciousness again, I feel somehow crazed, like the mental version of wild-eyed. I am tensed against the cold or curled on the edge of the mattress, trying to avoid the heat. I am clawing my way out of nightmares that are always about running from whatever is trying to kill me or desperately needing a rescue, with no hope of help. If I had to objectively interpret what is going on beyond the obvious fear/loss of control dreaming, I would say perhaps I do need a prescription remedy to calm whatever chemicals are misfiring or maybe I am low on some neurotransmitters and, just like I take thyroid hormones everyday, I should be taking something to regulate brain chemicals… But that’s just it: they’re BRAIN chemicals. That’s scary. And it’s such a crap shoot. What Rx to choose? So, I am at peace with my current stubborn obstinacy to sleep meds and maybe, if I ever take that step, I will wish that I had done it sooner, but I refuse to regret my choices. As if to reinforce my thoughts, when I called the closest hearing aid store to inquire about custom-fitted earplugs, the lady that answered the phone told me she had taken half an Ambien and wound up in an ambulance to the ER, with doctors thinking she had had a stroke. Anyway, I don’t know what the no-cpap experiment shows. I feel like I’m sleeping a little better and I think my Zeo graphs show slightly better sleep cycles, but I feel worse when I wake up and during the day. More tired and stiff and groggy and beaten up. Maybe it’s just allergies. My husband is watching tv with tissues shoved up his nose, so I know it’s definitely in the air.